SUMMARY: Otologic injury associated with fatal and nonfatal lightning strikes has been sporadically reported in the literature. The most common acoustic insult is a conductive hearing loss secondary to rupture of the tympanic membrane. Although conjecture has been made of the theoretic possibility of ossicular injury from lightning strike, to our knowledge, none has been demonstrated intraoperatively or postmortem. 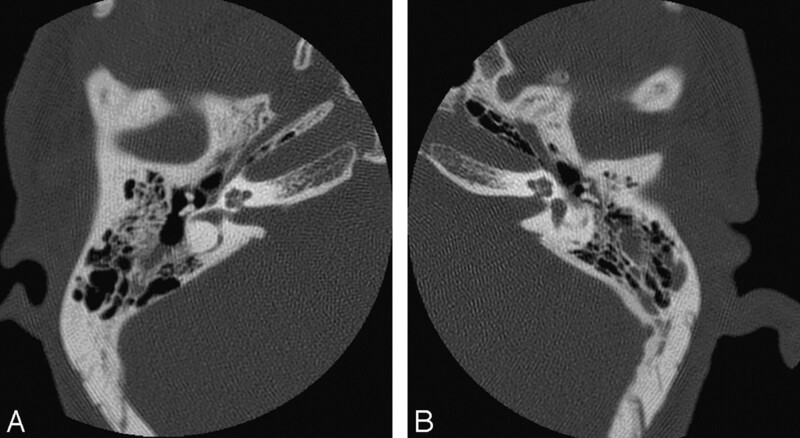 We report the first documented case of ossicular disruption in a lightning-strike victim. Lightning strikes can produce an array of clinical symptoms and injuries. Indeed, lightning strikes are seldom fatal; the majority of victims survive with various degrees of injury. There is frequently a delay in the detection of audiovestibular sequelae, the most common of which is tympanic membrane rupture. Review of the literature relating to lightning-induced neuro-otologic injury revealed no documented case of ossicular disruption despite reports of cases of middle ear exploratory surgery and postmortem temporal bone dissection. We present a case of ossicular chain damage in a lightning-injured patient confirmed on imaging and discuss some of the pathophysiology of acoustic injury in such cases. A 37-year-old man was referred to the emergency department following a witnessed lightning strike while jogging in a park during a thunderstorm. He had been wearing an iPod music player with earphones in place at the time. Witnesses saw the lightning strike a tree, and several birds were found dead at the scene in the vicinity of a large broken branch. The patient was thrown approximately 6–8 feet. The victim possibly had momentary loss of consciousness and was amnesic to the event. Burns were observed on his body, and his left training shoe was burnt and torn apart. The iPod he was wearing exhibited significant electrical damage, and there was evidence of burns in the pattern of the earphone cables extending bilaterally down the anterior aspect of his neck to his chest. The patient was unable to hear spoken words but had slight audition in his left ear to shouting. Physical examination of the patient revealed 1st- and 2nd-degree burns to the neck, chest and abdomen, and lower limbs; comminuted fractures of the mandible; and fractured teeth. Otologic examination demonstrated bilateral ruptured tympanic membranes with blood in both middle ears and external auditory canals. High-resolution CT (HRCT) of the petrous temporal bones (Fig 1) was performed. This revealed opacification of the mastoid air cells consistent with hemorrhagic effusions. No fractures of the petrous temporal bones were evident. Bilateral dislocation of the incudomalleal joints was noted. The remainder of both ossicular chains and both otic capsules was normal. A and B, HRCT of petrous temporal bones. Dislocation of the incudomalleal articulation of each ossicular chain is demonstrated. The remainder of the ossicular chain continuity was maintained—specifically the congruity of the stapes footplate with the oval window was intact. Note the opacification of the mastoid air cells as well as in the region of the aditus ad antrum of the right middle ear, consistent with hemorrhagic effusions. No fractures of the petrous temporal bones were present. Despite conservative management for 3 months, follow-up otologic and radiologic examinations revealed no change in the patient's status other than resolution of mastoid air cell fluid. The patient had been referred for ossiculoplasty at the time of submission of this report. The acoustic effects of lightning result from damage to the middle and/or inner ear. In addition, the central audiovestibular system is extremely vulnerable to the effects of lightning.3,5-7 Postmortem examinations of the temporal bones of lightning victims reveal numerous pathologic findings, including hemorrhagic and purulent effusions of the middle ear and mastoid air cells, rupture of the Reissner membrane, degeneration of the stria vascularis and organ of Corti, edema of the intracanalicular portion of the facial nerve, microfractures of the otic capsule, and inner ear hemorrhage.3,5-10 However, although temporary sensorineural hearing loss is frequent in victims, the most common otologic manifestation is rupture of the tympanic membrane, often with an associated conductive hearing loss.3,5-10 More than 50% of lightning victims have ruptured tympanic membranes. The pathogenesis of the middle ear otologic injuries remains contested. One mechanism proposed is the cylindric shock wave, which expands from the lightning bolt with enough force to rupture the tympanic membrane and can be transmitted to the inner ear. The force of impact of the sonic shock wave is directly proportional to the distance of the ear from the axis of the lightning bolt. This property of lightning can occur with direct or indirect lightning strikes.5-10 However, it has proved difficult to substantiate this cylindric shock wave theory with no documented evidence of ossicular disruption in examined victims, despite evidence of tympanic membrane rupture. Our case report provides imaging evidence to support this theory. Furthermore, 3 reports were identified in our literature review of victims who sustained otologic injury (ruptured tympanic membranes) while conversing on the telephone during lightning strikes.6,9,11 In a similar vein, the patient in our case report had the earphones of his iPod music player in place at the time of the lightning strike, and it is conceivable that these acted as the propagator for the lightning-induced cylindric shock wave that ruptured his tympanic membranes and caused bilateral ossicular disruption. Survival from lightning strike is far more frequent than fatality. However, victims commonly sustain a number of organ-system injuries, including neuro-otologic injury, the most common form of which is rupture of the tympanic membrane. We have demonstrated, with imaging evidence, a case of bilateral ossicular dislocation as well as a cautionary tale of the danger of wearing earphones when caught outdoors during a thunderstorm. In addition, it may be that HRCT of the petrous temporal bones should be implemented in the management protocol of the subset of patients who demonstrate persisting conductive hearing loss despite healed tympanic membrane perforation following conservative treatment as well as those in whom there is persistent clear otorrhea. Accepted after revision August 8, 2006.